I don't know if you have this problem, but we have this problem: every time we survey patrons they ask for more evening programs for working parents. However, when we do offer evening programs they are very poorly attended. I needed to come up with something that would draw in a nice crowd in the evenings, so instead of offering a plain old evening storytime over Winter Break, I borrowed the idea of a "Milk & Cookies Storytime". I put it on our calendar, requiring registration so I would have an idea of the supplies needed. And, as best laid plans sometimes do, things went a little bit awry. Registration was going like gangbusters and I was so excited that people were actually planning on coming to something in the evening! And then a week before the program, I discovered that a typo on the library-wide program calendar listed the program as 2:00pm instead of 7:00pm. I thought on it a little bit and then decided that I would go ahead and offer the program at 2:00 if people showed up for it. Then I'd repeat it at 7:00. If a bunch of people showed up, I had plenty of time to run to the store for more supplies. And I'd much rather put in a little extra work and offer the program twice than turn away anyone who made a trip to the library for our program. The program was advertised for ages 3-7 and I had an idea about how it would go: I'd share some of my favorite books and then put out milk & cookies for everyone to enjoy. At the last minute before the 2:00 program, I changed my mind. I figured I'd have a smaller crowd for that program, so I wanted to try putting out the refreshments at the beginning and inviting kids to enjoy their snack while they listened to stories. The program was a disaster. The first milk spill happened before we even started the stories. Luckily, I was prepared with many (MANY) napkins and towels. I had figured that milk would be spilled at some point. What I didn't count on was what a constant distraction the snacks would be. 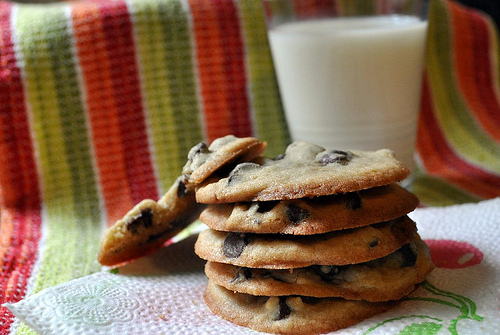 From various kids spilling milk (requiring various levels of my attention, depending on how attentive parents were) to other kids finishing their cookies and whining for more... no one was paying any attention to my stories. I tried switching it up and throwing in felt stories. I knew it would only invite more disaster to have the kids stand up and dance to the songs I had planned. I cut it short and made copious notes for the next session. True, part of the disaster came from the kids that showed up (I believe a home day care group came, all kids who were new to the library and very squirrelly the whole time). But part of the disaster came from how I had planned the program. I started with a book that was too long and didn't hold the kids' attention. Once I had lost them, I never really got them back. Serving the snacks at the beginning was a terrible idea and limited what I could do with the group. Normally with squirrelly kids, I'd ask them to stand up and do some stretching or dancing to get some wiggles out, but with cups of milk everywhere, I couldn't do that. It's a bummer when a program flops, BUT I couldn't concentrate on that. I knew I had to concentrate on making the program better for the next session! Before the next session, I pulled all new books. Even though the recommended program age went up to 7, I pulled books that were shorter and more geared toward the preschool age. I pulled a bunch of extra books so I could switch things up easily if the kids weren't into something I had picked. I set up small tables where kids could enjoy their snack AFTER the storytime. I put the cookies out on a tray, but left it in our office until after the program. The milk stayed in the fridge until we were ready for our snack. Book: Bark George by Jules Feiffer. I wanted to start with one of my favorites, a book that I felt very confident about reading since my program had gone so poorly the first time. Book: Actual Size by Steve Jenkins. Since I did have some older kids in attendance, I brought out this book. It went over the preschoolers' heads a little bit and I didn't read the entire thing, but this is a book that's easy to stop at any point so I didn't end up reading the entire thing. Song: My Bonnie by Jim Gill. Since the kids were getting a little antsy during Actual Size, we stood up to do this song. I asked them to think of words that started with "B" and they gave me many! Then we did the motions to this song. It was a great choice for emerging readers! Book: Rhyming Dust Bunnies by Jan Thomas. This silly book calls for rhyming words and definitely had the kids giggling along! I always start this book by making sure kids know what dust bunnies are. Felt: Fifteen Animals by Sandra Boynton. This was a nice transition because one of the dust bunnies is named Bob, as are fourteen of the animals in this book. 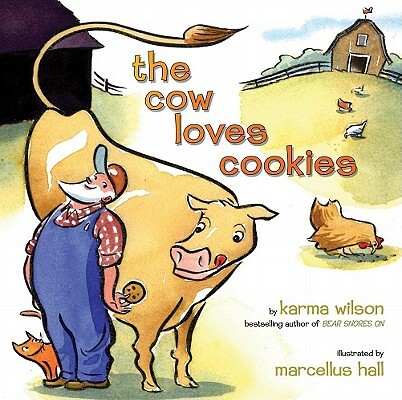 Book: The Cow Loves Cookies by Karma Wilson. I used this book last to transition into our snack time. It was maybe a tiny bit long for my crowd, but they definitely found it funny. After our storytime, I brought out the tray of cookies and the milk and invited them to find a spot at the tables and then come up to get their snack. I had 17 kids and they went through about half a gallon of milk. I had bought 2 gallons, but in the future I'll buy half-gallons because they'll be easier to pour from. They will eat as many cookies as are available. I put out two whole packages and they ate almost all of them, some kids taking four, five, six cookies at one go. In the future, I'll ask kids to start by choosing two cookies and then going back for more after everyone's had some. Once I fixed my problems, the program actually turned out to be really nice and I'm excited about offering it weekly over the summer. This just goes to show you that sometimes everything goes wrong and a program just flops, but that doesn't necessarily mean it was a bad idea. You can note what didn't go well and fix it for next time!